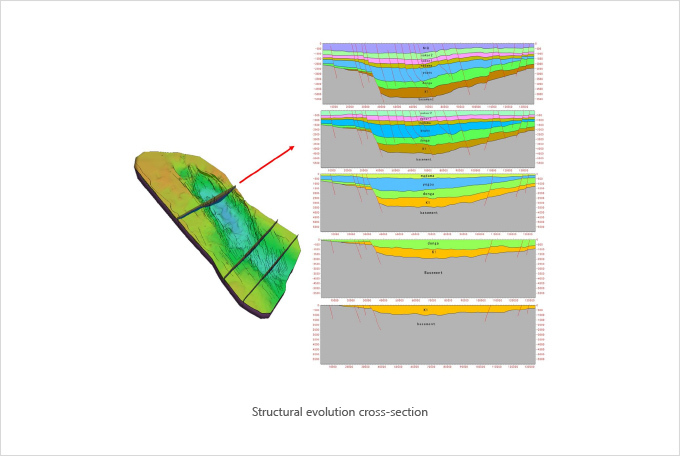 The Structural Restoration Module (SRM) in DepthInsight can be used to verify the geological understanding of how the reservoir was created through time using the structural restoration process. This gives the user a more reasonable understanding of the data as it follows geological principles to position the model back to a pre-faulted time. 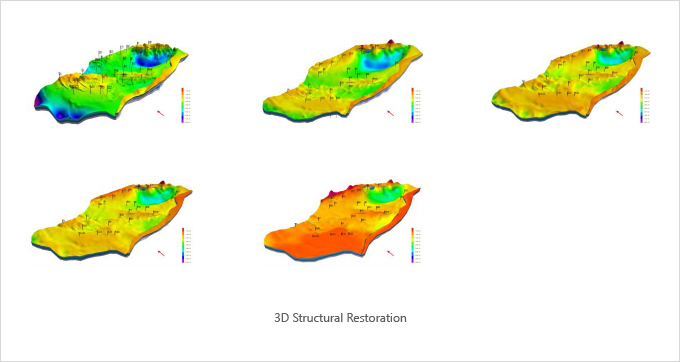 The system can visualize the restoration as an animation in 3D, and use the resulting properties for fracture analysis and more in other systems. The SRM is a 3D finite element, elastic mechanics, and geomechanics based method. It supports a 3D dynamic display of the structural restoration process of different period with or without displacement including stress and strain. It also supports the generation of paleo-structural maps and Structural evolution cross-section. This innovative method gives a much better insight into the geology and the reservoir as it was being developed over time. - Deduce the geological deposition and tectonic activity at each stage of geological time. - Visualize in 3d the dynamic change process of the geological structures. - Generate the paleo-structure plane maps and paleo-profile maps at any geological time. - Provides insight into the research of; ancient hydrocarbon generation, migration, accumulation, fracture prediction, stress field analysis, preservation and cap assemblage. Description：This video introduces our new paleo-structure restoration module showing the restoration results from present time to paleo time, also from paleo time to present time. The new method is based on Finite Element and Geomechanics. This case with complicated faults is a part of an extensional basin located in northwest of China. 4 times restoration was completed with Inclined Shear, Trishear, Fault Parallel Flow, Unfolding and other restoration tools. It is more persuasive to obtain the results of fault stages and the process of deposition. Differed from the Rigid Body Assumption(RBA), adopted in SRM in existing commercial software today, DepthInsight® achieves its restoration by performing Deformation Body Assumption(DBA), which is a fault blocks sliding (seamless and non-embedded) restoration process based on finite element analysis of elastic mechanics. DepthInsight® not only restores the structural model, but also restores the seismic volume and interpretation data, thus eliminates the influence of corresponding tectonic movement. The system also restores well log data in the framework so property models can be easily created in pre-fault conditions.